Trees for farmsteads, forestry, field and livestock-area shelterbelts require plans. The NRD or your local Natural Resources Conservation Service Office will meet with you to discuss what you want to achieve by planting trees. A plan will be developed with the varieties of trees/shrubs needed, the number of species and the proper spacing for the desired purposes. The trees are two-year old bare root seedlings and are approximately 12 to 18 inches tall. The seedlings are available in the spring with a variety of species offered, including cedars, pines, hardwoods and shrubs. For the best selection, placing orders in the fall and winter months are recommended. LBNRD offers both “handplant” and “machine plant” trees. Handplant trees can be purchased in smaller quantities, but they must be planted by the purchaser. Tree-planting machine rental is available. For larger plantings, the NRD will machine plant the varieties. The District offers cost-share for windbreaks that are over 100 plants and are designed according to NRCS specifications. Weed Barrier is a polypropylene fabric, with the appearance of tightly woven plastic burlap, used to control weed growth and help preserve soil moisture in tree and shrub plantings. This biodegradable fabric’s life expectancy is seven to nine years. The Barrier eliminates the need for mechanical or chemical weed control directly between and around the trees. Supplemental water is held in the soil longer when the weed barrier is applied. This is due to the limited amount of evaporation that occurs. Test results indicate survival rates of 95% or better (when conditions/weather are right) Weed barrier also helps to raise the soil temperature to encourage root growth in early spring and continues root growth later into the fall. The soil must be disked or rototilled to a garden-like condition for application of the fabric. The soil preparation strip must be no less than ten feet wide. There must be six feet between each tree or shrub. The fabric will be laid on first year plantings and some smaller two-year old stock. The older species will depend on size, spacing and ground preparation. It is impossible to place the fabric over cottonwoods and walnut trees due to their lack of flexibility. The NRD will only install weed barrier on level or straight rows. 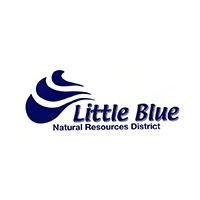 The Little Blue NRD offers cost-share funds for the installation of the fabric on windbreaks that are designed by the LBNRD or NRCS office. Landowners can also receive cost-share on drip irrigation instead of weed barrier, but not on both practices. This program offers financial assistance to citizen groups, civic organizations and governmental agencies in the development and/or improvement of Urban Tree Resources. The Community Tree Program encourages cities to develop an ongoing tree improvement program which, according to Community Forestry Standards, qualifies them for Tree City USA designation under Tier One Criteria. Establish a legally constituted Community Tree Board that has the responsibility of the proper public tree resource management. The Board may be an existing organized body, such as a town board.Conduct an inventory and assess the current public trees. The area Forester will conduct inventories and NRD personnel may assist. The Plan must be approved by a District Extension Forester or NRD. Submit to the NRD a proposed annual budget of estimated costs and how the community plans to meet these commitments for the length of the tree plan. Have an updated City Tree Ordinance. A copy of the Tree Plan and cover letter must be submitted to the NRD from the Community Tree Board no less than two weeks prior to the NRD Committee Meeting to consider action on the proposal. Funds Available: The NRD will provide 50% financial assistance on a per capita basis. The maximum contribution shall be $3.00 per capita, up to $10,000, with a minimum contribution of $500 to assist communities with small populations. The applicant shall develop and submit a five year work plan for tree planting, with guidance from the District Extension Forester or NRD if possible. The plan shall include a map showing where trees will be planted, a list of the trees with desired size and number to be planted, a time table for completion of the project and an estimated project cost. Develop a Work Plan of tree planting, removal, maintanance; and keep active (maintenance portion) for ten years. The sponsoring group will be required to provide funds or in-kind services to match funds profided by the NRD. Applications shall be submitted prior to April 1st. Funds Available: The NRD will provide cost share of 50% up to $1,500 per community, for projects which have been approved by the District. Funds will be limited to one request per community per five years.